No, we are not standing at the traffic lights or playing hopscotch. What we can see here is referred to by experts as automation without safety barriers. In the background, an industrial robot is moving and in front of it, we can see a pattern of lights with green, yellow and red areas. 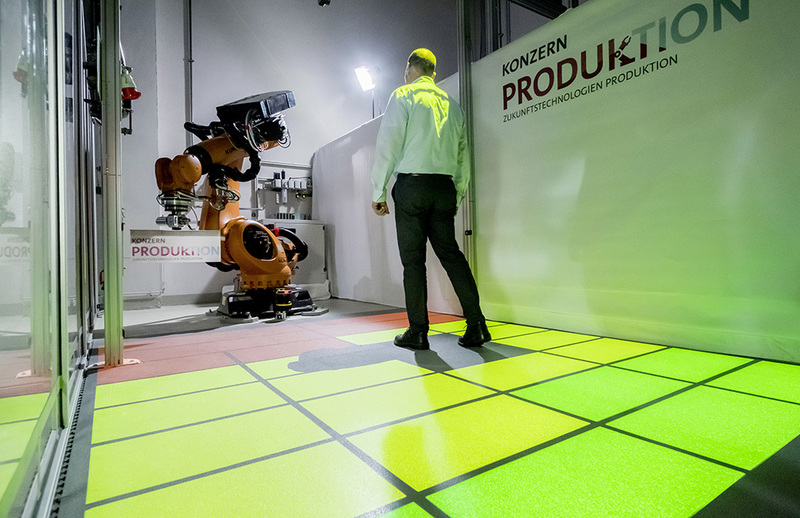 Group employee Karl-Heinz Häfner moves confidently towards the robot and is still in the green zone. As soon as he touches the first yellow area with his foot, the robot slows down. When the worker reaches the red zone, the robot stops abruptly. If Häfner moves his foot back out of the red zone, the robot starts to move again. What we can see here is a unique development within the Volkswagen Group: a human being can work absolutely safely in the immediate vicinity of an industrial robot without being separated by a fixed safety barrier. This is possible as a result of the laser safety scanner which reliably detects any movements of the employee. A high-level control system coordinates the movements of the human worker and the robot, slowing and stopping the robot as soon as the worker enters the relevant safety zones. Dr. Martin Gallinger, who is responsible for the further development of robot applications in Volkswagen Group Production, explains why the dynamic safety zones are so important for the production of the future: "Everyone is now talking about human-robot cooperation. To date, we have been concerned chiefly with cooperation with lightweight robots that weigh significantly less and carry lighter loads. Now we want to make industrial robots fit for cooperation with people. They can relieve the burden on human workers as large industrial robots can lift much heavier parts and pass them to people." In future, robots will be able to provide active support to people. Another advantage is the fact that existing robots can also be used for cooperation with people, saving the investment required for new robots. "Despite all the advantages of this new form of cooperation, one topic still has the highest priority for us – safety," Gallinger emphasizes. Safe working is ensured by highly advanced interactive safety zones. For test purposes, Gallinger's team has developed a prototype fit for use in series production together with Volkswagen's partners KUKA AG, Keyence Deutschland GmbH and Fraunhofer IFF. Color coding gives the employee a clear and simple indication of the area where he can work without any impact on the robot (green). The safety zones are dynamically adjusted in response to the movement of the robot. For example, if the robot is working in the background, far away from the position of the human worker, the green, yellow and red zones are moved accordingly. If the human worker is in the yellow zone, the movement of the robot is severely decelerated and even stopped in the red zone. This means that the employees concerned are absolutely safe and have complete clarity concerning the safety zone at all times. The prototype that has been developed confirms the technical feasibility of a new form of cooperation and an entirely new safety concept: "In the next step, we will be intensively testing and optimizing the prototype together with our project partners, health and safety experts, and production employees. We intend to use their feedback to develop the system together to the point where it is fully fit for use in series production," Gallinger adds.